Ken Habermann reports: "Went for a walk Saturday afternoon in Losen Slote Creek park in Little Ferry. I wasn't even really actively birding. Just getting some exercise. Still, I'm glad I brought the binoculars. "There was a nice mix of at least 5 Fox Sparrows, several Song Sparrows and numerous White-throated Sparrows. Also present were several Red-winged Blackbirds and 4 or 5 Carolina Wrens as well as at least 40 American Goldfinches feasting on gray birch catkins. Julie McCall reports: "Spent a few hours around DeKorte and Disposal Road Sunday, reaping the rewards of a new pair of binoculars. I didn't get the shrike but Disposal Road brought me Northern Harriers, Red-tailed Hawks, Northern Mockingbird, White-throated Sparrows, Song Sparrows, Downy Woodpecker. "The biggest bird of the day: adult Bald Eagle over the turnpike, circling for a few minutes then heading off toward Secaucus…"
New, Improved DeKorte Trail Guide/Map Is Here! The Meadowlands Commission is happy to announce that free copies of our new and improved DeKorte Park Guide and Map are available at the Meadowlands Environment Center. Two minor changes may be of particular note to birders. First, we have now included Disposal Road on the map, so those looking for, say, a certain Northern Shrike or raptors can find them more easily. Second, we have included a second name for the "Kingland Tidal Impoundment." That huge expanse is now also referred to as "The Shorebird Pool," as it was popularly called back in the day. The map also includes all the major trails, and distances, in case you want to see how far you've walked. 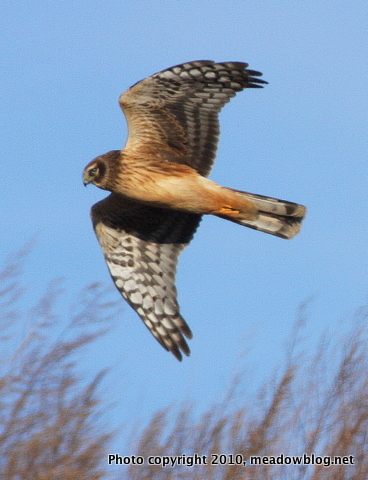 If you want great views of Northern Harriers, Disposal Road continues to be the place. We got this shot one afternoon last week, parked alongside the road. The hawk appeared from over the crest of the former Kingsland Landfill, the hunted on the hillside.